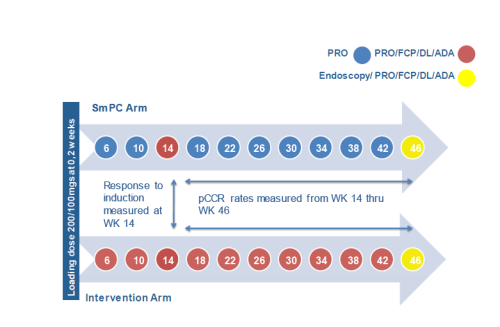 GOAL-ARC is a nationwide multi-centred investigator initiated randomized control trial to evaluate the use of personalized Golimumab (GLM) dose adjustment in ulcerative colitis. The primary objective is to ascertain if dose adjustment of GLM, based on GLM drug levels and FCP levels, results in higher response and remission rates than standard SmPC dosing. Patients with moderate to severely active ulcerative colitis requiring treatment with anti-TNF therapy will be recruited in six centres around Ireland (N=120). Eligible patients will be randomised in a 1:1 ratio to 1 of 2 treatment groups. Doses of concomitant medications will remain constant except for corticosteroids, which shall be tapered by 5 mg weekly after week 2 until discontinued. Patients will receive standard loading dose of GLM (200/100 mgs) at WKS 0 & 2. They will then receive 100mgs/ 50mgs depending on their weight as per SmPC. Patients will report their modified partial mayo score and SHS score every four weeks (PRO) and provide it to the investigator site via a web based application. At WK 14, a GLM drug level (DL) and anti-drug antibody level (ADA) will be collected using a CE marked kit. FCP levels will also be collected but no change in treatment shall be made based on these findings. At WK 46, sigmoidoscopy, FCP, GLM DL and ADA shall be taken. Patients shall be followed as per standard practice. 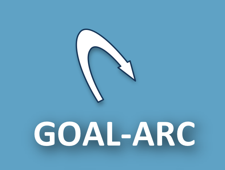 If a flare occurs treatment can be administered at the discretion of the treating physician to include GLM dose increase, introduction of steroids or alternate biologic agent but they will be classed as treatment failures for the purposes of GOAL-ARC. Patients will receive standard loading dose of GLM of 200/100 mgs at WKS 0 & 2. Patients will report their modified partial mayo and SHS score every four weeks and provide it to the investigator site via a web based application. In addition FCP, GLM DL and ADA shall be measured every four weeks. In response to DL and FCP levels the dose of GLM shall be escalated or reduced according to algorithm below from WK 6. Established diagnosis of UC and moderate-severe disease activity, defined as a Mayo score of 6−12, with an endoscopic subscore ≥2. Patients had an inadequate response to, or had failed to tolerate, 1 or more of the following conventional therapies: oral 5-aminosalicylates, oral corticosteroids, azathioprine (AZA), and/or 6-mercaptopurine (6MP); or corticosteroid dependent (i.e. an inability to taper corticosteroids without recurrence of UC symptoms). Patients concurrently treated with oral 5-aminosalicylates or corticosteroids were to receive a stable dose for at least 2 weeks before baseline, and patients receiving AZA and/or 6MP were to receive a stable dose for at least 4 weeks before baseline. Patients were required to maintain stable doses of their concomitant UC medications during the study. 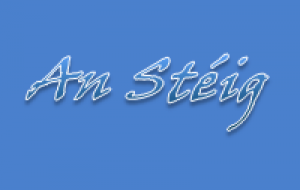 Pregnant patients or those who are breastfeeding will be deemed ineligible. Screening stool study positive for enteric pathogens or Clostridium difficile toxin. Oral corticosteroids at a dose >40 mg prednisone or its equivalent per day; receipt of cyclosporine, tacrolimus, sirolimus, or mycophenolate mofetil within 8 weeks before the first study agent injection; or use of an investigational agent within 5 half-lives of that agent before the first study agent injection.